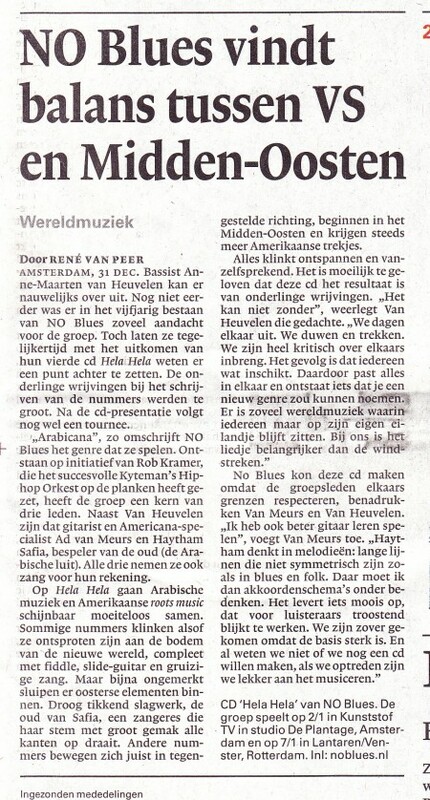 Wat begon als een experiment ontsproten uit het brein van Rob Kramer van Productiehuis ON, groeide uit tot een uitgebreide zoektocht naar ‘arabicana’, een muziekstijl die de verbinding legt tussen blues en traditionele Arabische muziek. Met de vierde cd van NO Blues lijkt het zoeken voltooid en een nieuw genre op de kaart gezet. 3VOOR12/Arnhem-Nijmegen ging met bassist Anne-Maarten van Heuvelen in gesprek over de reis naar muzikale volwassenheid en de essentie van muziek. 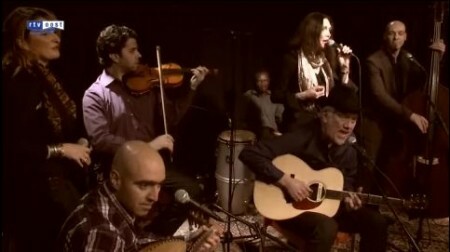 NO blues was founded five years ago to investigate the possibilities of combining the traditional American folk blues with Arabic music, which resulted in a new genre called Arabicana. With this fourth CD the trip around the world comes to an end for singer-guitarist Ad van Meurs, singer-bassist Anne-Maarten van Heuvelen and the Palestinian singer-U’d player Haytham Safia. But not without picking up some African influences on the road, provided by Sudanese Osama Maleegi again on percussion and this time also U’d. Violin player Morad Koury adds even more virtuoso strings, and the vocals of Shereene Danial joins those of permanent collaborator Ankie Keultjes. In most cases, the symbiosis between the genres is perfectly natural, with Empty Bottle as a strong example. Especially the way Safia’s sparkling U’d playing is a joy to the ear. Lyrically, it is often rather stereotypical country and blues: long-legged women, booze, infidelity and death, but Van Meurs convinces as singer and guitarist, the latter especially with the slide. And the sound is beautiful and unique, all you could wish for is more experimenting with strange measures, such as on Farah. 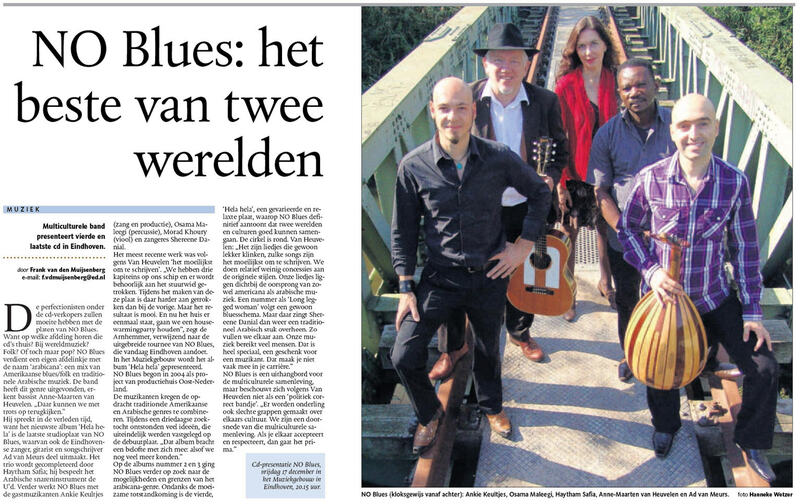 Hela Hela is the first of four albums by NO blues which is actually on the ‘ luisterpaal’ of 3voor12. It seems like we are finally outgrowing the stigma ‘worldmusic’. We feel very strongly about the fact that we are just playing music of the world and are by doing so, representing the global fusion of people and ideas. Although our music is deeply rooted in music traditions from all over the globe, being caged in to the worldmusic box always has been rather strange to us. The biggest downside of the world music stigma is also that you will get none or very limited airplay. Which deprives us from a big potential audience and ultimately will keep world music caged in to it’s own box. 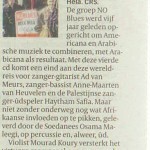 So we are very happy and grateful with the continues high rating for our new album @ the luisterpaal. Thanks for sharing your thoughts and votes for the album. These are the first small steps to set us free! Our dear friends from Palestine will be joining us for the 4 cd release promo gigs in December, so we hope to meet you there.